Find Colonial Parking® nearest to you! Colonial Parking operates hundreds of public parking garages in Washington, DC, Northern Virginia and Maryland. Take advantage of our newly deployed, free, iPhone App. 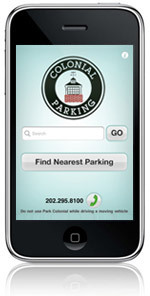 Available through iTunes, the Park Colonial ℠ App assists you in locating parking facilities in all of our 240+ locations in the Metro Area. Information such as rates, Hours of Operations, customer service phone numbers and directions to nearby facilities are also part of this feature packed mobile app.